Yoga is a physical, mental and spiritual practice, dating back thousands of years. Rooted in India, it resonates with people worldwide and 21 June has been declared International Yoga Day. 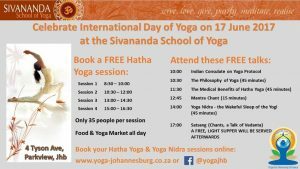 The Sivananda School of Yoga invites you to celebrate with us on Saturday 17 June 2017. A series of Hatha Yoga classes, Talks on Yoga, as well as a session of Yoga Nidra (the wakeful sleep of the Yogi) are available to you, free of charge. Book your Hatha Yoga and Yoga Nidra sessions to ensure a place. Our studio can accommodate 35 people per class, and is gently heated for the winter. A food and Yoga market will run all day. Buy delicious vegetarian and vegan food, yoga clothes, accessories, books, etc.